Location in New Castle Coonty an the state o Delaware. 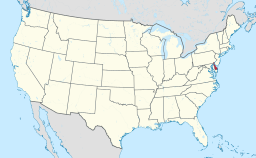 Wilmington is a ceety o the U.S. state o Delaware an the coonty seat o New Castle Coonty. Wi a population o 70,851 at the 2010 census, it is the maist populous ceety in the state. Wikimedia Commons haes media relatit tae Category:Wilmington, Delaware. This page wis last eeditit on 17 Mey 2018, at 19:12.